I can’t quite put my finger on when it started. I can’t even tell you exactly what it is. Midlife crisis? Wanderlust? A nagging dissatisfaction, the inability to muster normal enthusiasm for my normal life, the feeling that none of this matters. And the urge to walk away from it all. Today on my way to work, I stopped for breakfast at a neighborhood bagel shop. I walked from the overcast morning into the crowded, noisy interior. Trying to discern where the line formed, I looked at the selection of bagels in the case—a dozen flavors or more—and I walked right back outside. Too many people, too many bagels, too much light and noise and UGH. Well, the dogs would starve, for one. That’s not right. Also I’m not a jerk, so I wouldn’t leave my family or my job with no warning like that. Of course I can’t just drive away, but I can’t remember another time in my life when the urge was this strong. I don’t like it. Part of the problem is Yosemite. Victor took me there in April. Have you seen Yosemite? Have you SMELLED it? When I walked through Yosemite Valley, I was so overwhelmed by the beauty of it that I would close my eyes because they felt too full. Everything, everywhere, in every direction: beautiful. At night I was grateful for the sparseness of the tent cabin, for the visual reprieve, time to close my eyes and catalog the memories of the day so I would not forget the cliffs or the trees or the waterfalls or the stars. Vernal Fall in Yosemite. Crazy beautiful. 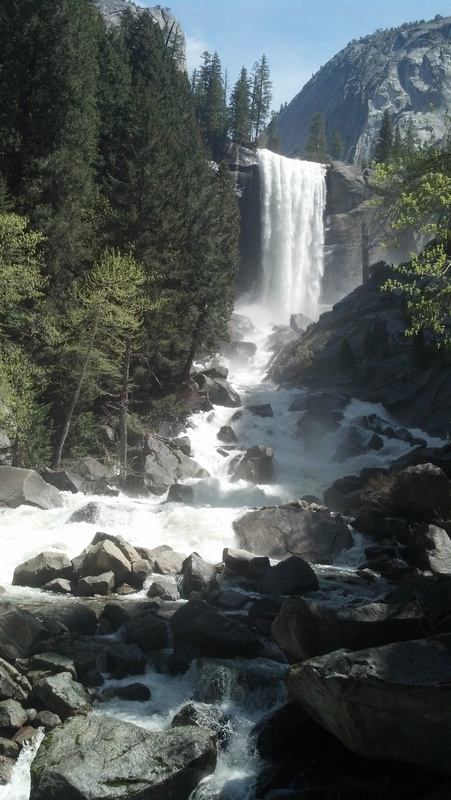 We hiked to the base of Vernal Fall and sat on a huge boulder with the river crashing around us. We ate wasabi almonds. This is what wilderness affords you: moments so grand that you MUST live them singularly. Sensory input so vivid and demanding that it drives away all but the immediate, so the only thing that matters is right now: how the granite feels, how the river sounds, how the trees smell and how the almonds taste. You know what doesn’t matter when you’re sitting on a boulder in Yosemite Valley? Rent. Your boss’s mood. Whether your kid will graduate high school. Whether you’ll find a better job or be successful or figure out what to do with your life when you’re already 41 and it’s halfway over anyway, for chrissakes. None of that matters in Yosemite. It’s like the inverse of Vegas: what happens outside of Yosemite STAYS outside of Yosemite. So now I’m home and all of those things are weighing on me. My kids are doing their best to screw up their lives and my job got cut in half and the ghetto cottage is on the block so I don’t know how long I can live there. I’m so overwhelmed that I can’t order a freaking bagel. I don’t even want a bagel. I just want pine trees and dirt. And a river. Also, I just finished reading Wild, by Cheryl Strayed, and that’s not helping either. Her life tanked, so she packed it in and decided to hike the Pacific Crest Trail. She spent several months hiking alone through California and Oregon. She hardly ever got to take a shower. She had to dig holes to poop in, and her toenails fell off. It’s not a glamorous tale. Wild should make me NOT want to run away to the forest. It should make me grateful for indoor plumbing and restaurants and such. But I understand why she chose to forgo those things for the wilderness, and I see the appeal more than I even want to. While she was hiking, Strayed had nothing but the moment she was living. She had few choices. She had no bills. No one was expecting anything from her. She was not expecting anything from anyone else. She walked until she was exhausted, then she read, then she slept. She confronted physical threats as they materialized: thirst, exhaustion, injuries, bears. Only the immediate mattered. I might be romanticizing the wilderness lifestyle a wee bit. Obviously, I don’t want to poop in a hole. I know that my sweet weekend getaway to Yosemite is not akin to wandering the Sierras with all my possessions on my back. Perhaps if I lived in a tent for a while, I would gladly write my rent check in exchange for the comforts it buys me. Perhaps if I were really faced with bears and rattlesnakes, I would complain less about my teenager. And that’s kind of the point…I don’t want to run away so much as I want a break in perspective. Being in the wilderness helps me see my problems on a different scale. It makes me feel small in a good way; it helps me boil things down to the essentials. That’s what I want: to be concerned only with the immediate. To stop worrying about the kids, the job, the bills—all of it—if not forever, then for a summer or even a week. Fewer choices, more freedom—just for a while. This entry was posted in Places and tagged Cheryl Strayed, hiking, midlife crisis, overwhelmed, running away, wilderness, Yosemite by midlifemeg. Bookmark the permalink. I have often felt the same way. My brother used to say ‘all I need is a bowl of rice and a glass of water’. Well, a bowl of rice and some teriyaki steak and a beer. That’s all I need. It’s a slippery slope…then you need a knife, where will it end? Oh, it’s true– my lot is not so bad at all, compared to many. Thanks for reading! I’m with ya Meg, I would love to live in a cabin in the woods somewhere in Arkansas or Tennessee and not worry about rent, taxes, work, school, bills, etc… You would only poop in a hole until you built yourself an outhouse. If only I could get Theresa to want to do the same, we’d be so outta here =) But alas I digress to the daily grind that never ends…………. I say Yos Mite. Long O. Thank you, my friend. I hope to spend many hours at the Barn! Yep. This too shall pass… right? What a lovely comment, Bruce! I will check out Charles’ post for sure.